FIENS was well represented at a truly important event in December of 2017, when an educational course with multiple partnering organizations celebrated the establishment of ongoing neurosurgical care under a graduate of the neurosurgical training program based in Nairobi. Dr. Benjamin Okanga was trained through the program with the wonderful efforts of our board member, Dr. Moody Qureshi, who established the COSECSA training program and has been actively supporting regional service sites in Kenya in preparation for the graduates of these programs becoming established as permanent neurosurgical care leaders. This wonderful occasion of Dr. Okanga initiating his practice at the Coast General Hospital in Mombasa will fundamentally change the care of 4 million people in that region. Without neurosurgical care the ability to care for head trauma patients, cancer patients, spinal cord injuries, and those with cerebrovascular pathology are all significantly limited. With the presence of such a program, progress can be made on all of these fronts. This was not lost on our partner colleagues. The meeting was sponsored by the World Federation of Neurosurgical Societies and included educational offerings from some 70 people including 49 trainees. It featured simulation labs, live surgery demonstrations, demonstrations on microscope use, clinical teaching lectures and rounds on patients. It was extremely gratifying to see young faculty that were former students of our programs now training their own new residents. These came from throughout the entire sub-Saharan region including Ethiopia, Uganda, Kenya, Tanzania, Mozambique, and Sudan. The emphasis was educational and the enthusiasm was evident. This is a very positive step in decades of work to provide care to the entire region, working through the concepts of service through education, establishing training programs, and then continuing education of these trainees through such courses which include everything from positioning patients, patient selection, surgical techniques, and modifying surgical techniques in resource limited settings. This sort of educational program is a major undertaking and accomplishment, of which FIENS and its partner organizations are very proud. Oprah Winfrey’s recent speech at the Golden Globes electrified America, calling attention to the dreams of little girls and little girls of color. She spoke of the awful injustices black women have faced for far too long. She, now famously, stated, “their time is up,” referring to oppressors. Being the first black woman to receive the Cecil B. DeMille Award was not lost on her. Being first is powerful. It means that little girls looking up at you on TV or in a hospital hallway can dream bigger. Drs. Nancy Abu-Bonsrah and Juliet Sekabunga also know what it’s like to be first. Dr. Abu-Bonsrah is the first black female neurosurgery resident at Johns Hopkins. Dr. Juliet Sekabunga recently passed her board exam to become the first female neurosurgeon in the country of Uganda. These two women share a beautiful understanding of what it means to break new ground: the challenges, triumphs, friends and rare foes, and the dreams that keep them pushing to reach the top. The extraordinary thing about Drs. Abu-Bonsrah and Sekabunga is that neither would describe themselves as extra-ordinary. Dr. Abu-Bonsrah grew up in Ghana. Her family came to the U.S. when she was 15 years old for a job opportunity for her father. She said it was hard to make friends as a teenaged immigrant, especially because she’s not “super outgoing” and relied on family and the U.S. Ghanaian community for support. She went to Mount St. Mary’s University, where she earned a biochemistry and chemistry double major. “Wow, that’s a lot,” I remarked when we spoke. But she humbly contested, “It was only a few extra classes.” From college, she applied to medical school and was accepted to Johns Hopkins University. Getting to Hopkins was an accomplishment, but the next the challenge was finding what she wanted to do. She’s the first doctor in her family, so she was already paving a new path. “I came in to medicine to serve” she said. She wanted to serve in the developing world. Having once watched as a neurosurgeon in Ghana who treated patients all day but then left many more untreated in the waiting room, she saw a need for more neurosurgeons in the developing world. She was lucky at Hopkins to find two great mentors, Dr. Rory Goodwin and Dr. Daniel Sciubba, without whom she may not have made it into neurosurgery. They helped her through what she called a “crisis of faith,” not knowing if she could fit into the culture of neurosurgery as a black woman and self-described introvert. She credits them for a “confidence boost and social boost” that set her up for success in the field. Dr. Abu-Bonsrah recalled how she woke up eagerly on her match day morning, anxious to find out if her dreams to become a neurosurgeon would come true. She and her husband “got hype” to Ghanaian music (of course), and she sat through long speeches at Hopkins that she joked “no one cares about.” She waited to open her letter, surrounded by proud (but notably tardy) friends and family. The letter came. Her family watched. When she opened it, she became the first black woman to match at Johns Hopkins for neurosurgical residency. Being a new intern is tough, but Dr. Abu-Bonsrah made sure to point out that it’s tough for everyone. “My co-interns and I talk about internship not as a learning curve but a steep hill — always going up and trying not to roll back down,” she said in reference to her experience. As a black woman, she understands some of her experiences are potentially different than her male co-residents’; for example, some patients don’t expect her to be a doctor, much less their neurosurgeon. Yet, she remains positive and thankful. “At least I’m not practicing in 1970. I’ve heard terrible stories about how it was to practice for women and minorities back then,” Abu-Bonsrah reflected. She is excited there’s a new emphasis on diversity so that people like her have the opportunity to train in neurosurgery and are supported by mentors. Dr. Abu-Bonsrah is conscious that her journey is a result of the struggle of many and that, thanks to them, she’s in a position to be a “first.” Dr. Sekabunga shares similar joy and excitement about the path to becoming the first woman neurosurgeon in Uganda. Dr. Sekabunga grew up in Uganda, daughter of Professor Sekabunga, a well-known pediatric surgeon. Despite having a surgeon father, her beginnings were humble, and her path to neurosurgery complex. She grew up as the youngest child of 10 siblings, some of whom she never met and a few she met later in life. “We lost three,” she stated soberly, referring to her siblings. Most of her childhood was spent with her mother and was overall pretty similar to other children growing up in Kampala. She went to a very good Catholic school and thought she would become a banker. This was a big dream, after all she always saw bankers “count money” and she thought she would like to do this too. “Never did I think of doing neurosurgery,” she laughed. Things changed during secondary school. This school was 20 km from her home, and fees were harder to acquire as her father had retired. When her family struggled to put up the funds, her mom’s sister stepped in to help. “She was a doctor and changed my perspective on what I thought about being a banker”, she laughed. She decided to test out medicine and prepared to take a big exam. But, just prior to the exam, her mom passed away suddenly. “It was hard. It was so emotional for me, but you know there’s always a point when you have to close your eyes and think about your future… I remember when the [exam] results came out, I was the best girl in my class,” she stated with a balance of pride and mourning. She moved on in school and studied sciences. Five months later, her father passed away as well. At this time, she didn’t know what to do. “What happens next?… Will the people you once knew look back and lend a helping hand?” she wondered. She stated that she “always had a dream to keep her running the race.” She later applied and was accepted to the school of medicine in Mbarara University, receiving a government scholarship in medicine and surgery. Dr. Sekabunga didn’t always hear encouraging words — she was told that she might not want to help people forever and she heard terrifying stories about anatomy lab — yet, she stepped up to the challenge and succeeded in medical school. 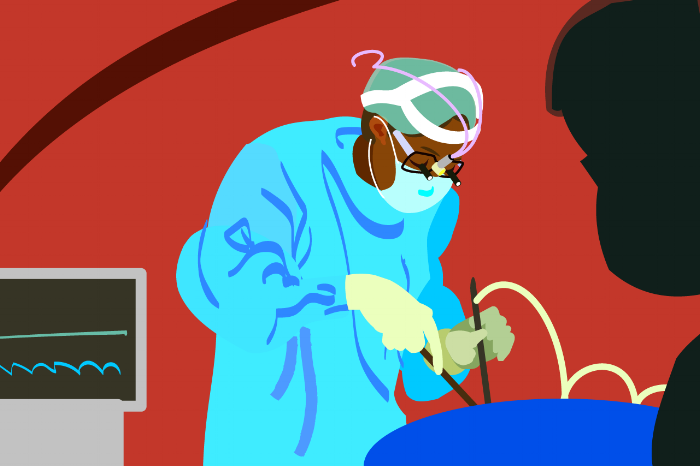 She gleefully described every rotation as fun but surgery as “even more fun,” and she began to wonder if she’d follow in her father’s footsteps as a surgeon. Inspired by the movie City of Angels, which she had seen as a teenager, she thought she would become a cardiothoracic surgeon. She said she always thought, “My God, they touch the heart!” Later in pathology lab, she saw the brain of a man that had been shot in the head and at that point considered, “Is this what I came for?” After that she couldn’t turn back from a decision to pursue neurosurgery. Ready to run to this challenge, she was stalled when she fainted the first time she saw skin cut in the operating room. Who would want to be seen as the “girl that fainted” in her dream vision? Being a general surgeon wasn’t Dr. Sekabunga’s plan; she had a neurosurgery goal in mind. Getting what she wanted, and loved, meant four more years. She went to Mulago to complete her neurosurgical training. That is where she experienced her steepest academic climb. With few residents and up to 70 or 80 patients, she was overwhelmed every minute. Yet, her hard work began to pay off in 2013 when Dr. Michael Haglund from Duke University came to Uganda, and the neurosurgery program expanded. “Dr. Haglund and the Vice Chancellor of Mbarara University Professor FIB Kayanja were both very excited to train a woman,” she said. When she met Dr. Haglund she said he looked at her like, “This is what I’m looking for,” thrilled to train a woman in Uganda. She received a salary and numerous opportunities in neurosurgery, for which she is incredibly grateful. Sure, she has experiences when patients are surprised to see her as a doctor, but Dr. Sekabunga’s dreams are too big to let this phase her. She waits patiently for them to figure out that this soft spoken, young, small woman is their neurosurgeon and one of the best at it. She passed her neurosurgical boards this January and briefly celebrated, but now she’s on to planning life for her and her son. Soon, Dr. Sekabunga will be heading to Toronto Hospital for Sick Children for Pediatric Neurosurgery Fellowship. She’s following her dream to teach and operate in Uganda, and her son, now age 8, wants to be something different every day. Both Dr. Sekabunga and Dr. Abu-Bonsrah express fears and challenges they faced in their paths to neurosurgery. What about the biological clock? Will I fit in to the culture? Am I strong enough? Can I do this thing? They are united by their determined spirits, quiet but impenetrable demeanor, and senses of humor. “All those people worried about the number of years you’re doing this; you’ll look, and they’ll be in the same place in 4 years,” Dr. Sekabunga joked. She certainly isn’t in the same place, and neither is Dr. Abu-Bonsrah. They are first. To the girls watching, Dr. Sekabunga and Dr. Abu-Bonsrah have a similar message: always have a dream and keep your eye on that dream, so that when things break down around you, you don’t break down. Theresa Williamson, MD, is a Duke neurosurgery resident and a 2018 Doximity Scholar. The Henry Ford-Myanmar project celebrates its fifth year of educational partnership between the Departments of Neurosurgery at the Henry Ford Hospital and Yangon General Hospital. The project was initiated by Jack P. Rock, MD, a member of the Foundation for International Education in Neurosurgery (FIENS) and member of the Department of Neurosurgery at Henry Ford Hospital. At the beginning of the affiliation, the partnership consisted of solo visits to assist with teaching and operating. After two years, Dr. Rock initiated a team-based approach in which an entire surgical team and biomedical technician made the trip to Yangon. These interactions culminated in an official Memorandum of Understanding between Henry Ford Hospital and Yangon General Hospital that was fully supported by the Ministry of Health of Myanmar. Myanmar team surgeons and administrators made their first trip to Henry Ford in 2016, and since then two neurosurgery residents from Yangon have come to Henry Ford’s Department of Neurosurgery for two-month clinical observer rotations each year. In February 2017, a two-day neurosurgery boot camp was arranged in Yangon by Drs. Rock and Myaing during which 45 neurosurgery residents were in attendance along with 25 neurosurgical faculty and 15 instrument company representatives. The boot camp received outstanding reviews from both the students and instructors, and the next boot camp will be held in the winter 2019. In November 2018, the first neurosurgery oral examinations were administered in Myanmar during which all neurosurgery residents were tested and given direct feedback. Because of the valuable feedback from the participants, the oral exam will become an annual undertaking. There are three new initiatives which we are very excited about. To foster more regular interaction, clinical case review meetings via Skype are being held on a biweekly basis. Beginning April 2018, a traumatic brain injury project will commence at North Oakalappa Hospital in Yangon where Dr. Myaing is currently the Director of Neurosurgery. Each neurosurgery resident at the hospital has been given an iPAD with Red Cap data collection systems in place supplied by the Henry Ford team. We plan to review the data on all patients admitted with head injury over a three-month period to try and identify patterns which may help in the understanding and treatment of head injury in this setting. Lastly, in October 2018 we plan to visit six major medical centers around the country in order to establish a data collection process that will document the extent of traumatic brain injury in Myanmar. The partnership between the Departments of Neurosurgery at the Henry Ford Hospital and Yangon General Hospital has yielded benefits for all involved . We hope that in the years to come, these ongoing initiatives will serve to strengthen our partnership and produce even greater benefits for both practitioners and patients. Jack Rock MD, is the recipient of the 2018 AANS Humanitarian Award, as well as a member of the Department of Neurosurgery at the Henry Ford Hospital, and a member of the FIENS board. Copyright © 2018 FIENS, All rights reserved. Special FIENS Newsletter for our members and volunteers.